I was sitting in church listening to the message this morning, which was about how God wants to be the best Father we could ever ask for. Unfortunately, my human father has disappointed me so many times that I have a hard time seeing God as my Father. Yes, I've given my life to God but the word "Father" doesn't work for me. 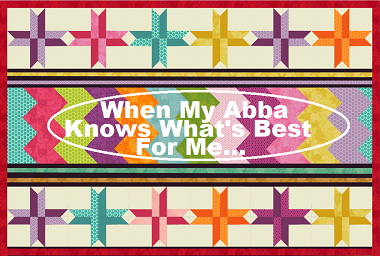 However, the word "Abba" does work for me. As Christians we're all on a journey - one that doesn't end until we're finally home with our Abba in Heaven. 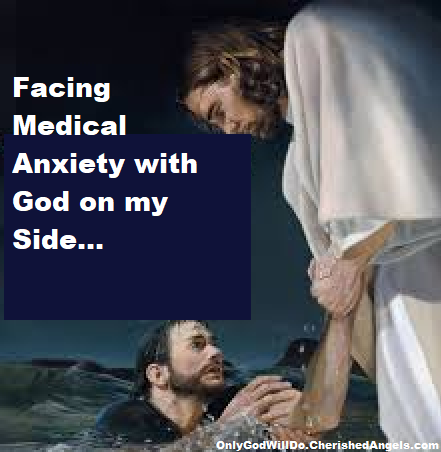 As someone who has so many health issues (2 small brain aneurysms, 2 noncancerous tumors, adrenal fatigue, and fibromatosis) I often have people offer to pray for me, which is great BUT what people don't understand is that praying for healing isn't what I need. I know this sounds strange. You're probably wondering, "Don't you want to be healed?" "Don't you believe you can be healed?" Well, of course I want to be healed and I believe Jesus will do whatever He wants with my life. However, there's one truth that will prevail. God always has my back. 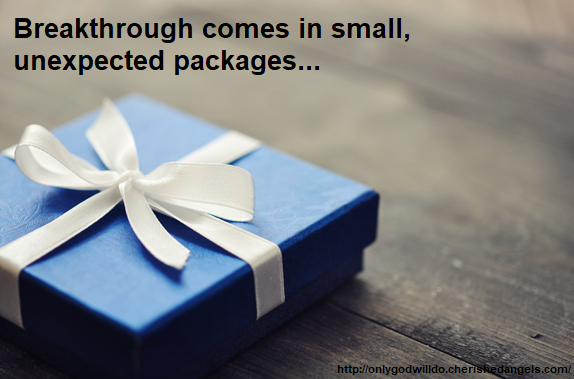 Breakthrough comes in small, unexpected packages. I've been in need of certain tests for a while now. I've been praying about it and not sure what to do. I knew the endocrinologist would be a great person to consult because what I'm dealing with is definitely an endocrine issue as per my naturopath, but I was in tears the other day because I can't get in there until the end of February and I'm beyond exhausted with everything. While in tears I cried out to God, "I can't do this any more." Today, He answered, "No, you can't, BUT I can and will."